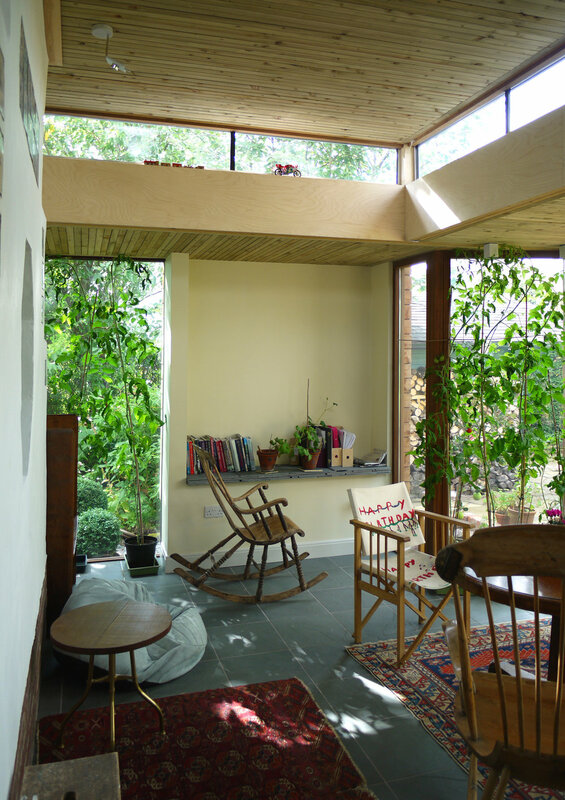 "you can see the wood and the trees"
Our client’s brief was to form a southwest facing living space that provided an escape from the Arts and Crafts house out into the garden. Our clients are artistic and have a real concern for the environment – their house is full of objects made from recycled materials and timber including a plywood bike!!! In collaboration with Edinburgh Napier University’s Centre for Offsite Construction and Innovative Structures and the Scottish Forestry Commission and with ERDF funding, we have developed an innovative use for low grade Scottish C16 Sitka Spruce to form solid construction panels. 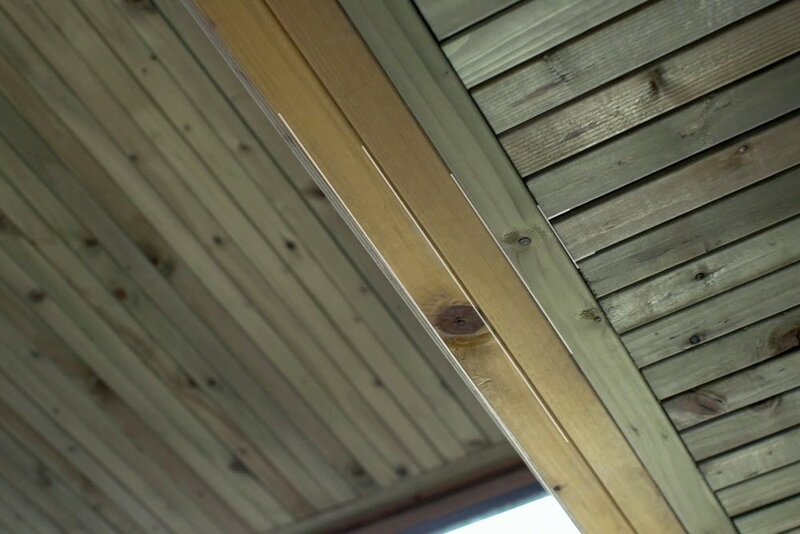 Using a widely available and inexpensive resource, it has many of the advantages of cross laminated timber but developed reflect to the characteristics of the fast growing, less dense nature of Scottish timber. Nail-lam is mono-directional in span and very efficiently optimizes the bending and shear strength of the timber to span long distances in minimal thicknesses. In effect, it is a nailed brettstapel. The panels have been physically tested in bending and racking to provide design data for use in Euro Code 5 structural analysis and fire performance tested to demonstrate compliance with BS EN 1365-1 and approval under the Building Standards. A paper on the development and application of the system was presented at the World Conference on Timber Engineering in Auckland, NZ in 21012. This project, completed in January 2013, is the first commercial project to be constructed using a Scottish solid timber panel system and demonstrates how low grade Scottish timber can, through intelligent application, be optimally engineered to add value to a Scottish resource and support our rural communities.